There are several types of chart markings and axis labels you can add to your charts. You can modify their appearance to emphasize your data. Charts have a placeholder title (“Title”) that’s hidden by default. You can show and rename the chart title. In the Chart pane of the Format inspector select the Title checkbox. Double-click the placeholder title, then type your own. To change the appearance of the title, such as its font, size, and color, double-click the title again, then use the tools in the Chart Title pane of the Format inspector to make changes. 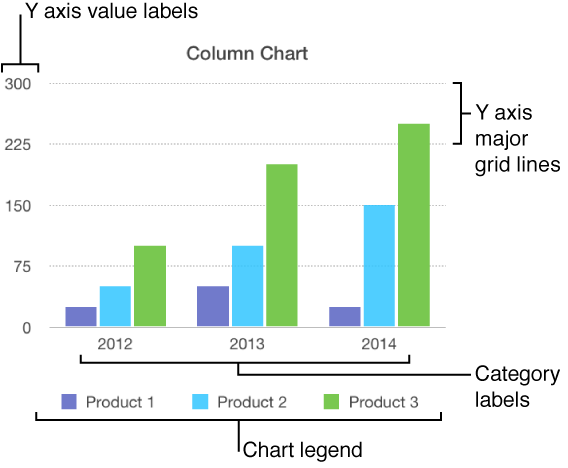 Bar, column, line, area, and pie charts have labels that show the values of specific data points. By default, these value labels are hidden for new charts, but you can make them visible and specify a format (for example, number, currency, or percentage), change their font and color, and more. In the Series pane of the Format inspector, click the disclosure triangle next to Value Labels, then choose a number format from the pop-up menu. Note: Depending on the type of chart, this section may have a different name. For example, an interactive bubble chart has a Bubble Labels section. Use the other controls to make further adjustments to the labels. Add a suffix or prefix: Anything you enter is appended or prepended to the label. Specify where numbers appear: Choose an option from the Location pop-up menu. Show the thousands separator: Select the Thousands Separator checkbox. To change the font, color, and style of the labels, click any value label on the chart. All value labels for that series are selected. In the Value Labels pane of the Format inspector, use the controls to make changes. Only the labels for the selected data series are modified. To change labels for another series, click one of its labels, then make changes. To select multiple series, select one, then Command-click another. To select all series, select one, then press Command-A. If you change the font for the entire chart, the font for the value labels also changes. Tip: You can create a custom format for displaying numbers or date and time. To make changes for only one wedge, click it. Show data point labels: Select the Data Point Names checkbox. Show data values: Select the Values checkbox. Change the number format: Choose a format from the Value Data Format pop-up menu. If you want the value labels to match the format of the original data in the table, choose Same as Source Data. Change the position of the labels: Adjust the Distance from Center slider to specify where the numbers appear. Error bars are represented as small marks whose length indicates the amount of uncertainty associated with a given data series (the data’s variability). These bars give you a general impression of your data’s accuracy. In the Series pane of the Format inspector, click the disclosure triangle next to Error Bars, then choose a type of error bar from the pop-up menu. Choose how error values are calculated from the second pop-up menu, and change the range if you want. To change the appearance of the error bars, click an error bar. All error bars for elements in the same series are selected. In the Error Bar Pane of the Format inspector, use the controls in the Bar Style and Shadow sections to make changes. Repeat steps 4 and 5 to change the appearance of the error bars for other series. Trendlines show you the overall direction (or trend) of your data. Trendlines are mostly used for making financial investment decisions. In the Series pane of the Format inspector, click the disclosure triangle next to Trendlines, then choose a type of trendline from the pop-up menu. Show names for the trendlines: Select the Name checkbox, then type a name in the field. The name you type appears for all trendlines on the chart. To change a name, double-click it on the chart, then type a new one. Show the equation or R2 value: Select the Show Equation or R2 Value checkbox. To change the appearance of a trendline, click the line so you see white dots at either end, then in the Trendline pane of the Format inspector, use the controls in the Stroke and Shadow sections to make changes. Most types of charts have axis markings, which you can modify in a number of ways. 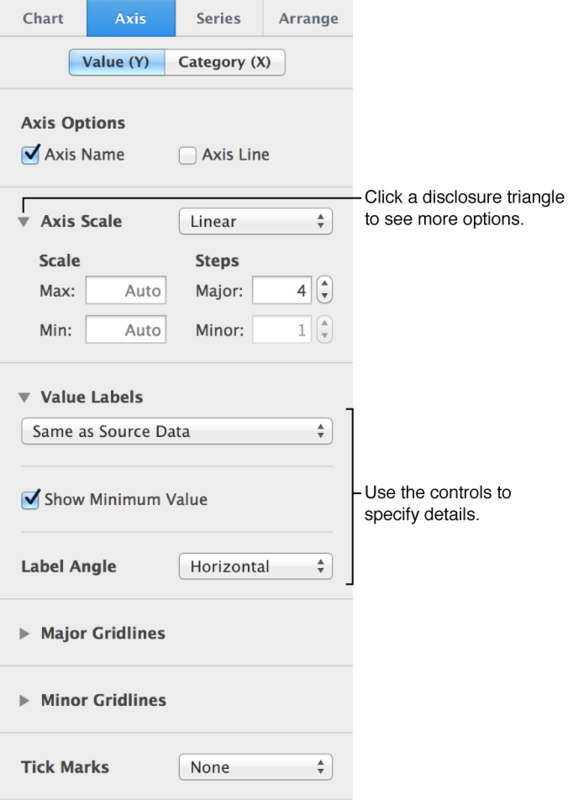 You can change which labels appear on an axis, the angle of the labels, the range and frequency of the markings, and more. You can also set whether to show chart grid lines and specify their appearance. Modify markings on the value-axis: Click Value (Y) at the top of the pane. Modify markings on the category-axis: Click Category (X) at the top of the pane. Use the controls in the pane to make adjustments. To see all options, click the disclosure triangles to the left of the section headings. If you’ve turned on Axis Name and want to change the placeholder axis name that is added, triple-click the name on the chart, then type your own. Select the chart, then in the Chart pane of the Format inspector, select the Legend checkbox in the Chart Options section. Use the tools in the Style pane to change the appearance of the legend text, add a background fill, add a border, and more. Drag the handles around the legend to resize it. An interactive chart presents data in stages so that you can emphasize the relationship between groups of data. Interactive charts can be used to show data such as sales by group over time, expenses by department, and population changes by country per continent. The example below shows the growth of three species during a three-year period. You can interact with the chart using a slider and buttons or buttons only. In the Chart pane of the Format inspector, click the disclosure triangle next to Interactive Chart, then choose an option from the pop-up menu.